This wine was in the fridge, awaiting a risotto night. I do love risotto night, mostly because I get to eat risotto, but partly for the wine too. The rule on risotto night is we have risotto, obviously, and that requires a glass of white wine to go into dinner, meaning we have the rest of the bottle to enjoy that evening. It’s always something of a juggling act. We don’t want to put a great wine into a risotto, but you don’t want a horrid one either, not least because that’s your drinking choice for the evening. I tend to aim for an inexpensive wine that arrived in a mystery mixed case as my default risotto choice. We do have the back-up choice that if the wine isn’t good (rather than being properly bad) we can have drunken spaghetti the next night to use it up. Bel Olivier Sauvignon Blanc from Virgin Wines smells fresh and inviting. It’s off-dry, with just a touch of sweetness, not enough to be worrying. It has a medium acidity and a medium alcohol level. It tastes good, not great, but good in a midweek kind of a way. There’s some creaminess but the overall impression is fruit, fresh squished summer fruit, nothing terribly defined. This certainly isn’t a “cat’s pee on a gooseberry bush” varietal exemplar. It’s softer than that, gentler and with a mineral edge that gives it a slightly different feel to a classic Sauvignon Blanc in either the French or New Zealand style. 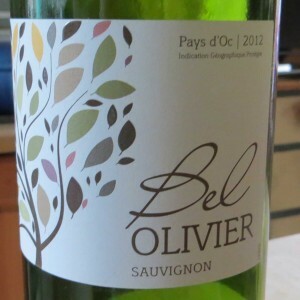 Bel Olivier is easy drinking, and I can imagine it going down a treat in the garden on a warm summer’s evening. A definite “pass” on the risotto night test.